For other uses, see Thracia (disambiguation). For the modern geographic region, see Thrace. Roman empire under Hadrian (ruled 117–38), showing the imperial province of Thracia in southeastern Europe. The Roman diocese of Thraciae. From the perspective of classical Greece, Thracia included the territory north of Thessaly, with no definite boundaries, sometimes to the inclusion of Macedonia and Scythia minor. Later, Thracia proper was understood to include the territory bordered by the Danube on the north, by the Black Sea on the east, by Macedonia in the south and by Illyria to the west, roughly equivalent with the territory of the Thracian kingdom as it stood during the 5th to 1st centuries BC. With the annexation of the Thracian kingdom by the Roman Empire, by order of emperor Claudius, in AD 46, Thracia (formally provincia Thracia "Thracian province", ἐπαρχία Θρᾳκῶν "eparchy of the Thracians") was established as a Roman province. After the administrative reforms of the 3rd century, Thracia was reduced to the territory of the six small provinces of the Diocese of Thrace. Later still, the medieval Byzantine theme of Thracia contained only what today is Eastern Thrace. The Odrysian kingdom of Thrace became a Roman client kingdom c. 20 BC, while the Greek city-states on the Black Sea coast came under Roman control, first as civitates foederatae ("allied" cities with internal autonomy). 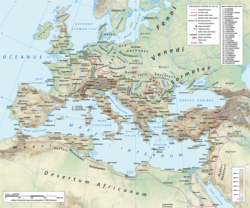 After the death of the Thracian king Rhoemetalces III in 46 AD and an unsuccessful anti-Roman revolt, the kingdom was annexed as the Roman province of Thracia. The new province encompassed not only the lands of the former Odrysian realm, but also the north-eastern portion of the province of Macedonia as well as the islands of Thasos, Samothrace and Imbros in the Aegean Sea. To the north, Thracia bordered the province of Moesia Inferior; initially, the provincial boundary ran at a line north of the Haeumus Mountains, including the cities of Nicopolis ad Istrum and Marcianopolis in Thracia, but by the end of the 2nd century AD the border had moved south along the Haemus. The area of the Thracian Chersonese (modern Gallipoli Peninsula) was excluded from its governor's purview and administered as part of the emperor's personal domains. The province's first capital, where the Roman governor resided, was Heraclea Perinthus. Thracia was an imperial province, headed initially by a procurator, and, after c. 107/109, by a legatus Augusti pro praetore. Otherwise, the internal structure of the old Thracian kingdom was retained and only gradually superseded by Roman institutions. The old tribal-based strategiai ("generalcies"), headed by a strategos ("general"), were retained as the main administrative divisions, but some villages were grouped together into kōmarchiai ("village headships") or subordinated to neighbouring cities (the two Roman colonies of colonia Claudia Aprensis and colonia Flavia Pacis Deueltensium and several Greek cities, many of whom were founded by Trajan), which were set apart. In the mid-1st century, the strategiai numbered fifty, but the progressive expansion of the cities and the land assigned to them reduced their number: by the early 2nd century, they had decreased to fourteen, and c. 136 they were abolished altogether as official administrative divisions. As it was an interior province, far from the borders of the Empire, Thrace remained peaceful and prosperous until the Crisis of the Third Century, when it was repeatedly raided by Goths from beyond the Danube. During the campaigns to confront these raiders, Emperor Decius (r. 249–251) fell in the Battle of Abritus in 251. Thracia suffered especially heavily in the great Gothic seaborne raids of 268–270, and it was not until 271 that Emperor Aurelian (r. 270–275) was able to secure the Balkan provinces against Gothic raids for some time to come. Generally, the provincial and urban policy of Roman emperors, with the foundation of several cities of Greek type (city-state), contributed more in the progress of Hellenization and not the Romanization of Thrace. So by the end of Roman antiquity, the phenomenon of Romanization occurs only upon the Lower Moesia, while Thrace lying south of the Haemus mountains had almost completely Hellenized. As regards the Thracian dispersion outside the borders (extra fines provinciae), from epigraphic evidence we know the presence of many Thracians (mostly soldiers) throughout the Roman Empire from Syria and Arabia until Britain. Under the administrative reforms of Diocletian (r. 284–305), Thracia's territory was divided into four smaller provinces: Thracia, Haemimontus, Rhodope and Europa. The new province of Thracia comprised the northwestern portion of the old province, i.e. the upper valley of the Hebrus river between Haemus and Rhodope and including Philippopolis (in Thracia), which had become the provincial capital in the early 3rd century. It was headed by a governor with the rank of consularis. The four Thracian provinces, along with the two provinces of Moesia Inferior, were grouped into the diocese of Thraciae, which in turn was part of the Prefecture of the East. Militarily, the entire region was under the control of the magister militum per Thracias. ^ Swinburne Carr, Thomas. The history and geography of Greece. p. 56. ^ a b Smith, Sir William (1857). Dictionary of Greek and Roman geography. London. p. 1176. This page was last edited on 20 March 2019, at 05:12 (UTC).